Vegan Mashed Potatoes are a must for any dairy-free eaters. You can still get creamy, “cheesy” mashed potatoes without using cow’s milk or butter. 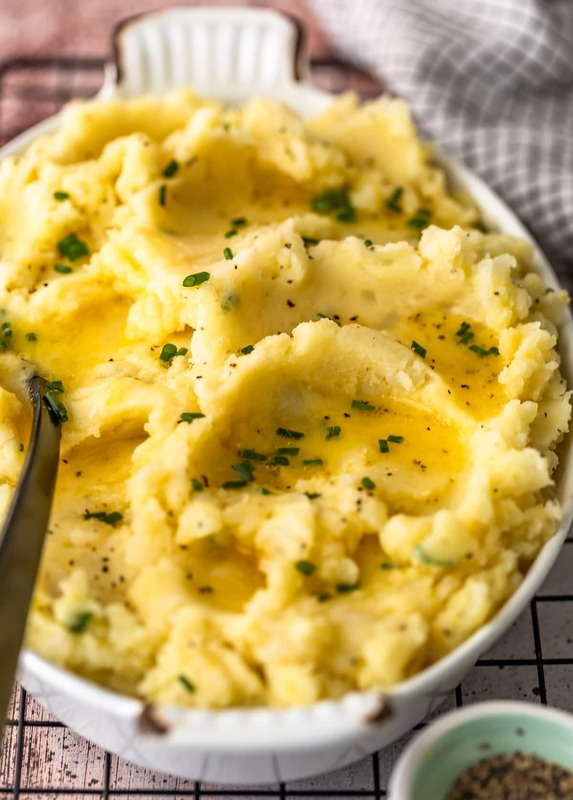 These dairy free mashed potatoes are the perfect vegan side dish for any meal, and the flavor is unbeatable! 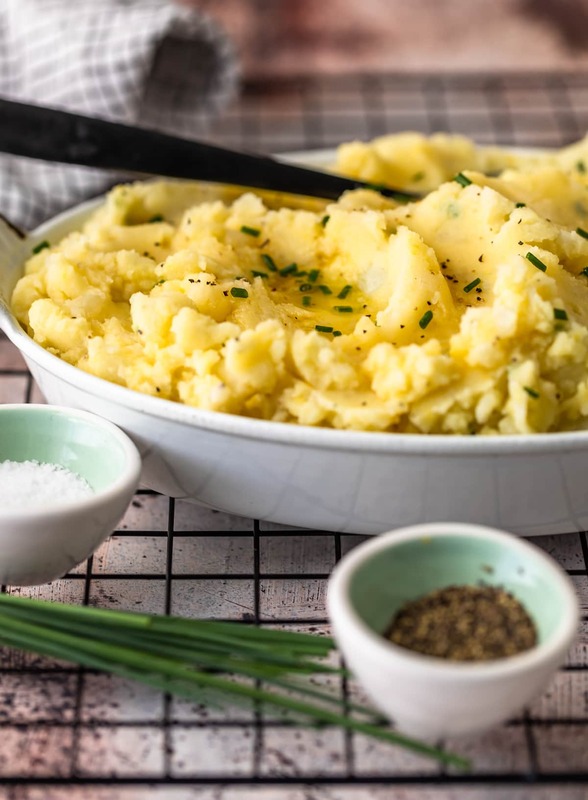 This vegan mashed potatoes recipe proves you can have creamy potatoes without dairy products. Plus they have a delicious cheesy flavor you won’t believe! Mashed Potatoes are one side dish that seems to pop up on every holiday table. They’re easy, they’re delicious, and who doesn’t love creamy potatoes? 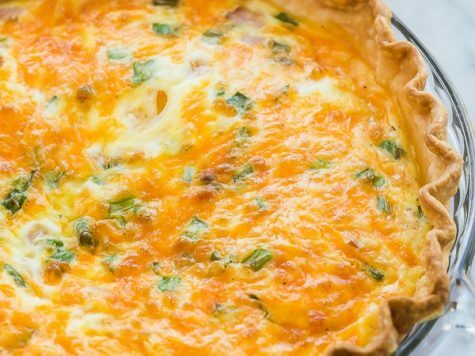 But any dairy-free people might feel like they can’t typically eat them, since most people load in the milk, butter, cheese, and sour cream. 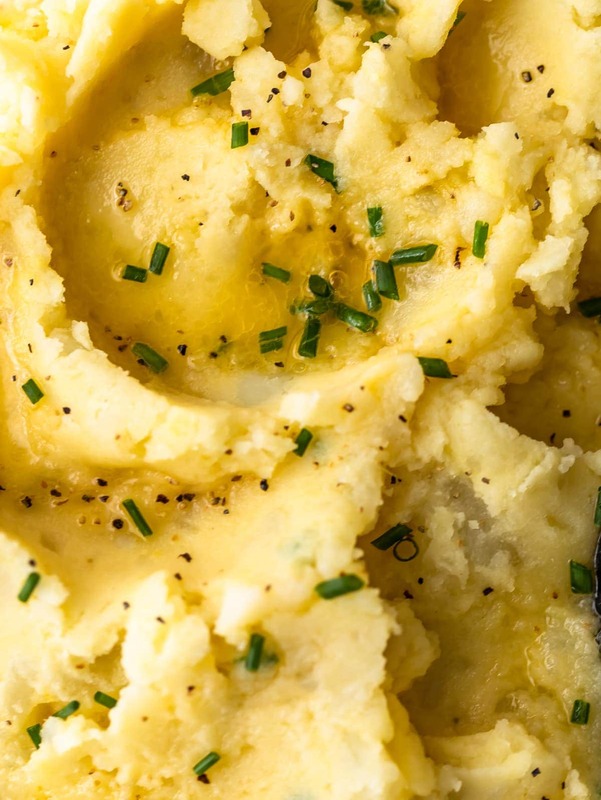 Luckily, tasty vegan mashed potatoes exist! And they’re not hard to make at all. 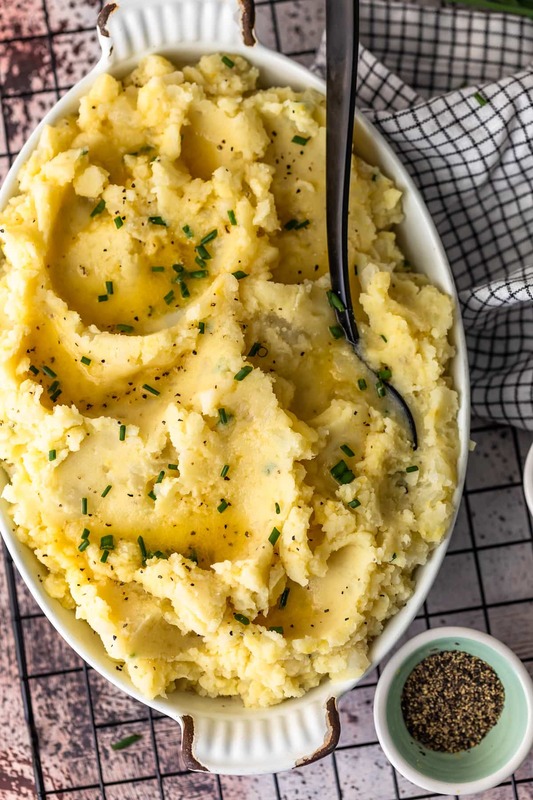 There are tons of vegan and dairy-free alternatives these days, so there’s no reason to miss out on cheesy mashed potatoes just because you can’t have dairy. This dairy free mashed potatoes recipe is creamy, full of flavor, and it even tastes CHEESY. So you won’t have to miss out on this favorite dish during the holidays anymore, and it’s likely no one would even notice that it’s a vegan side dish. Mashed potatoes for everyone! Indulge in cheesy mashed potatoes WITHOUT dairy products. That’s right, vegan mashed potatoes that taste cheesy and creamy! Whether you are fully vegan, or just following a dairy-free diet (hello my lactose-intolerant people! ), these dairy-free mashed potatoes are perfect for you. Get creamy, cheesy potatoes without the use of any animal products! YES, it’s possible to get Creamy and Cheesy Mashed Potatoes that are still VEGAN! To get that great cheesy flavor, I enlisted help from my friends at Bob’s Red Mill! 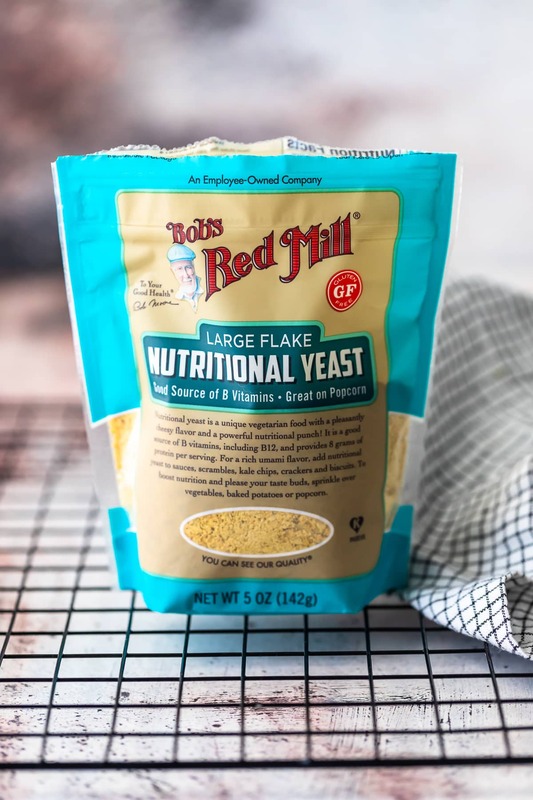 Bob’s Red Mill Nutritional Yeast is one of my very favorite ingredients. I’ve used it in my Vegan Queso, and was instantly in love with how well it substitutes for cheese. Nutritional Yeast is very popular in Vegan Recipes for its nutty and cheesy flavor, and is so easy to use. I trust Bob’s Red Mill for their quality products, and I also love that you can buy them on Amazon. This is such a great product to keep in your pantry, get creative! You can buy Nutritional Yeast HERE and find our more info HERE. What can you replace milk with in mashed potatoes? 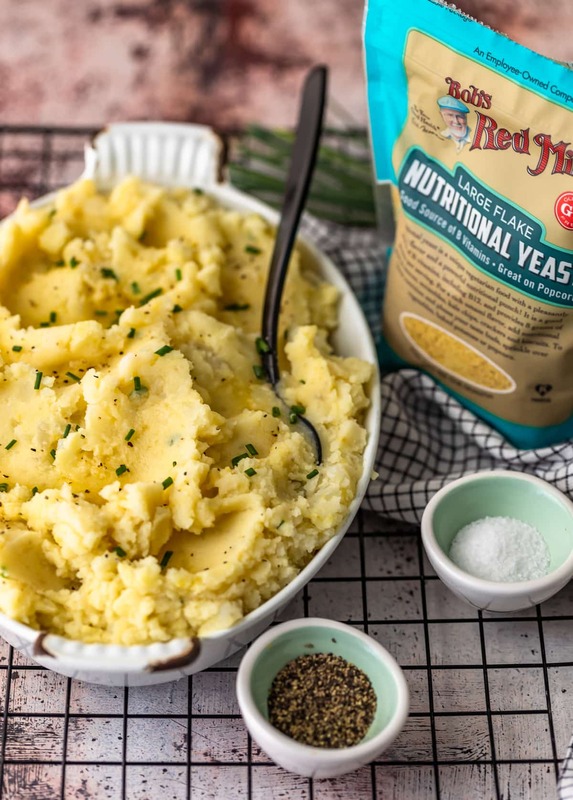 If you want to make vegan mashed potatoes, you’re going to need some good alternatives to the traditional dairy milks and butters. In order to mash and blend up your potatoes into something delicious, you’ll still need something creamy to mix in. Luckily, it’s really easy to substitute non-dairy milks and butters for your mashed potatoes to get the same result. 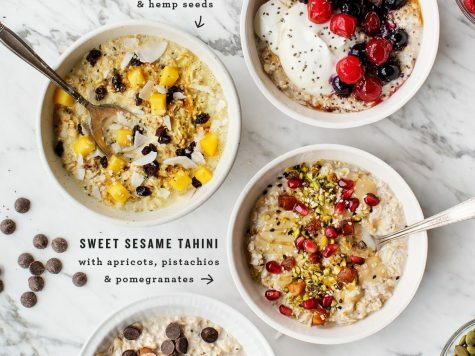 I recommend using unsweetened almond milk for this recipe, but you could also try soy milk, coconut milk, rice milk, etc. Make sure you get an unsweetened, unflavored option, otherwise the flavor of your potatoes might be a little off. 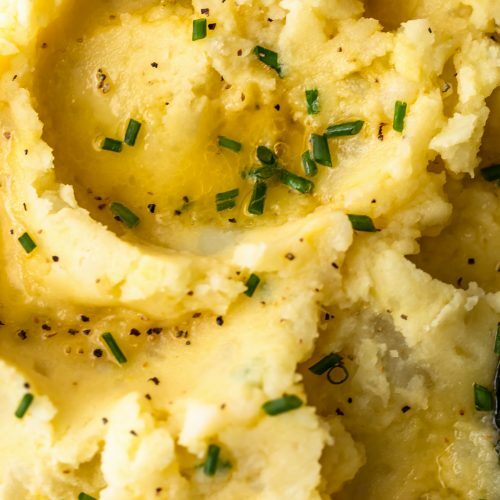 Making vegan mashed potatoes is just as easy as making regular mashed potatoes. The substitutions are very similar to the traditional items, they just happen to be dairy-free! So the process for making these is the same as what you’re used to. Begin by boiling a large pot of salted water, and then add in the peeled and cubed potatoes. Boil potatoes for 20 minutes, stirring occasionally. Drain the potatoes and place them in a large mixing bowl. Now it’s time to mash them up! If you like a bit of texture, just use a potato masher or large fork. If you want them much smoother, you could then use an immersion blender or a hand mixer to further mash them. Lastly, stir in the vegan butter, almond milk, nutritional yeast, chives, and salt & pepper to flavor them. Using the immersion blender during this step will make them extra creamy. And that’s it! 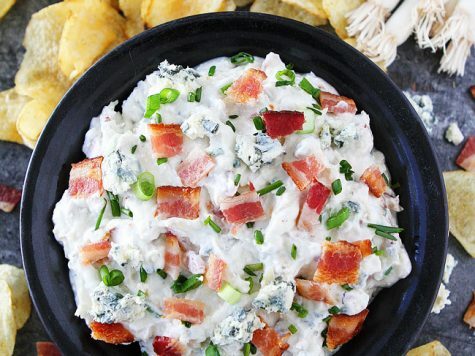 About 30 minutes and you have creamy, cheesy flavored potatoes for all. 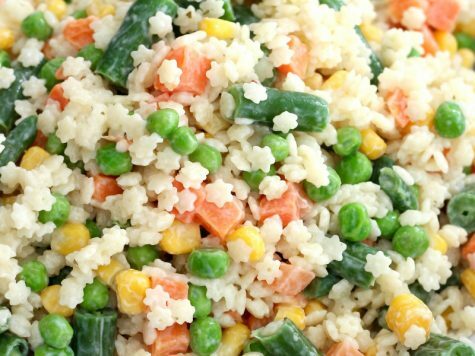 Creating delicious vegan side dishes for any meal is easier than you think. 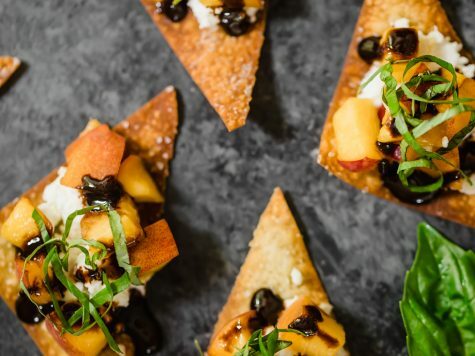 Veggie sides are often vegan without even thinking about it, and it’s easy to replace your usual ingredients in some dishes with dairy-free options. Just like we did here, nutritional yeast can add cheesy flavor to so many recipes, and vegan butters and milks are easy substitutes. 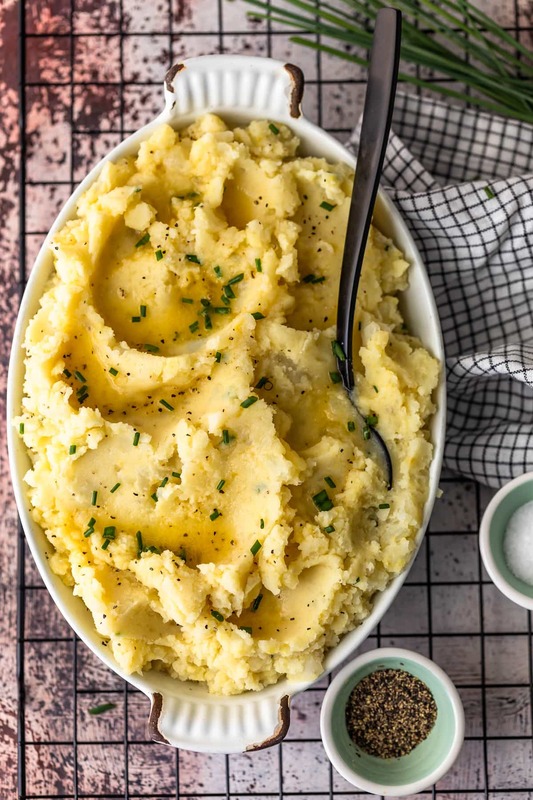 These vegan mashed potatoes are definitely a favorite, and they’re so good, most people wouldn’t even notice they’re vegan! 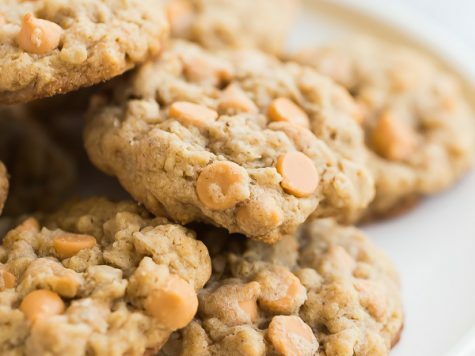 Here are a few more vegan and dairy-free recipes to try out! 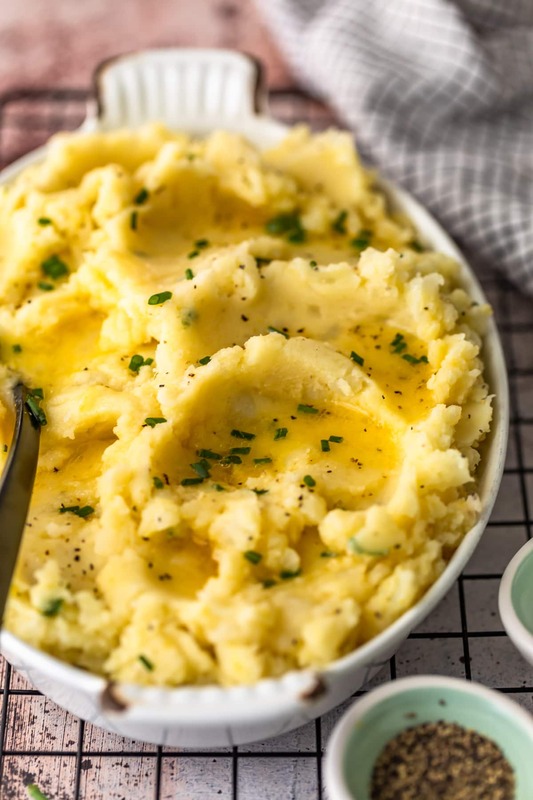 Whether you’re vegan, lactose intolerant, just trying to avoid dairy, or none of the above, I know you’re going to love the incredible flavor of these creamy Vegan Mashed Potatoes! See the recipe card below for details on how to make Dairy Free Mashed Potatoes. Enjoy! Looking for more mashed potatoes recipes? I’ve got you covered! Bring a large pot of salted water (at least 3 quarts) to a rolling boil. Add in the cubed potatoes and stir. Allow to boil for 20 minutes or until fork tender. Stir occasionally. Drain and add potatoes to a large bowl. Stir in the vegan butter, almond milk, nutritional yeast, chives, and salt and pepper. NOTE: If you prefer really smooth mashed potatoes, you can use an immersion blender and blend the potatoes, butter, and milk until smooth OR you can place in a blender in batches before returning to the bowl and stirring in the remaining ingredients.